Even log trucks get gussied up for Montesano's Festival of Lights. 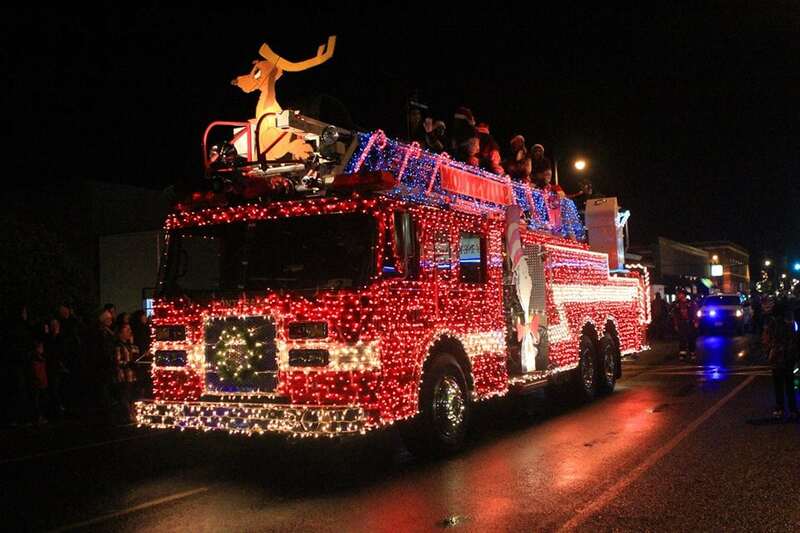 From Christmas tree lightings and parades to plays, movies and festivals galore, holiday cheer is coming to Grays Harbor. There are so many events to choose from, your only problem is going to be not having enough time to attend them all. 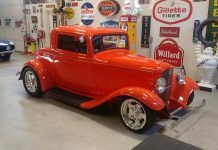 There is something for the entire family on this list, including the pets. So get out your calendar now to mark some of this year’s highlights. The 2nd annual Aberdeen Winterfest kicks off at 5:30 p.m. December 1 at Zelasko Park, 250 S. F St., with caroling and the arrival of Old St. Nick himself atop an Aberdeen fire truck. The tree lighting is set for about 6:00 p.m. with complimentary cocoa and cookies. 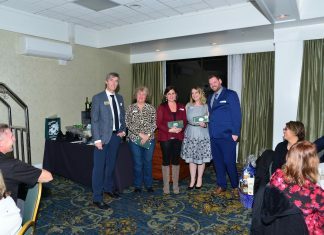 Many of Aberdeen’s downtown stores will have hours extended to 8:00 p.m. to shop special sales and enter prize drawings. The festival runs through Saturday, December 2 with even more fun and games including breakfast with Santa, crafts, pictures with Santa for pets and even a special Holiday Market. Read more about the Aberdeen Winterfest here. 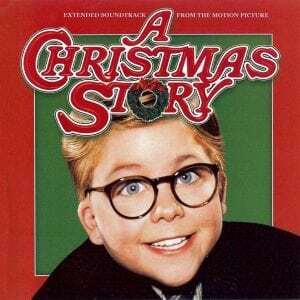 The holiday classic, “A Christmas Story,” is showing at 7:30 p.m. December 2 at the 7th Street Theatre as part of the Ho, Ho Hoquiam festival. One Saturday, December 2 it all starts with the Ho, Ho Hoquiam Fun Run that starts from City Hall. The event includes a 2 mile walk, as well as 2-mile, 5k and 10K runs, starting at 10:00 a.m. (Registration is at 9 a.m.) The cost is $15 with a t-shirt and $10 without. The festivities continue at 4:00 p.m. with the Cocoa Stroll and Festival of Trees, giving festival goers an opportunity to sip hot chocolate while admiring the decorated trees in downtown businesses. “The Polar Express,” at 7:30 p.m. Friday, November 24, and Saturday, November 25. “Holiday Inn,” the 1942 musical classic that launched “White Christmas,” is set for 7:30 p.m. Saturday, December 16, and 2:00 p.m. Sunday, December 17. 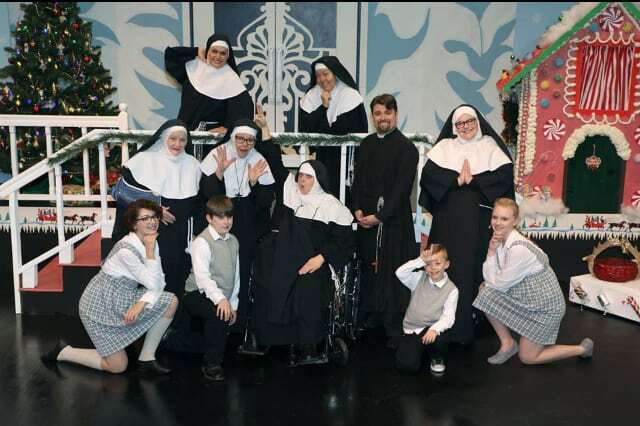 Speaking of holiday shows, this season the Driftwood Theater in Aberdeen is presenting “Nuncrackers,” a holiday musical for the whole family. Laughs are aplenty as Christmas songs, dances and comedy routines are being taped for a TV special by the sisters in their convent basement. The show plays November 24, 25, and December 1 and 2 at 7:30 p.m. November 26 and December 3 at 1:30 p.m. Tickets are $15 and available at the door, at local businesses and online at the Driftwood Theater’s website. At Grays Harbor College’s Bishop Center in Aberdeen, the Grays Harbor Civic Choir will present their “Celebrate the Season” concert at 3:00 p.m. Sunday, December 10. Enjoy traditional holiday music complete with a sing-along. Then December 16 at 7:30 p.m. and December 17 at 3:00 p.m. the GHC Opera Workshop will present “Amahl and the Night Visitors.” This three-hour beloved Christmas opera tells the story of a shepherd boy and his mother whose lives are changed when the Three Kings pass through their village on the way to Bethlehem. Tickets for each event are $10 with children 12 and under free with a paying ticket holder. A new tradition is coming to Seabrook this Christmas season – the first annual Surfin’ Santa and Holiday Lights parade, taking place November 25, December 16 and 23 at 5:00 p.m. along Seabrook Avenue, and Front Street. 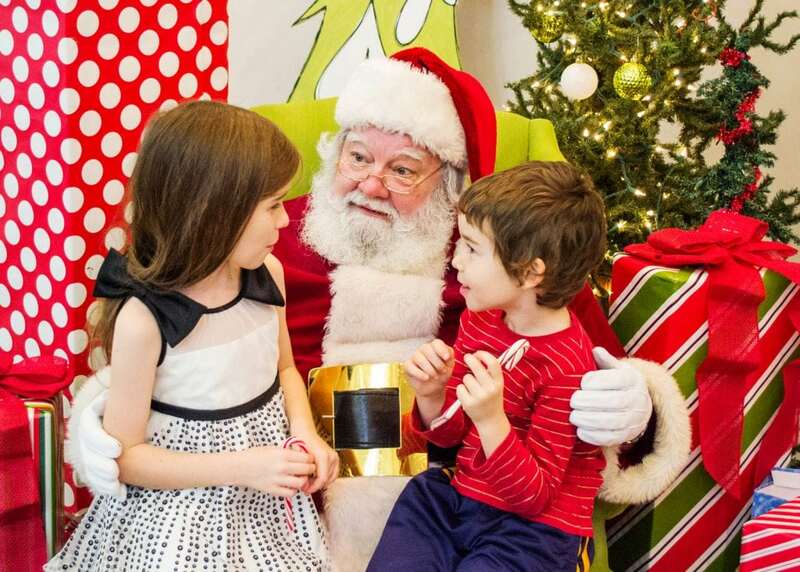 Visit Seabrook this holiday for a festive breakfast and photos with Santa. Photo credit: Emily Carrico. Hometown favorite Ericka Corban is giving a holiday concert at town hall on December 23. And finally, don’t forget the holiday bazaar on December 2 and 3 from 11:00 a.m to 4:00 p.m.
Other holiday activities include the Glass Float Find from November 27 through December 22, where each day Seabrook glass floats will be hidden in and around Seabrook and on the beach, yours to find and keep. Learn more at Seabrook’s website. The annual Christmas Tree Lighting at Beerbower Park in McCleary is happening December 1. Santa will be making an appearance and cocoa, cookies and candy canes will be provided. The next day, the annual Santa Breakfast is set from 8:30 a.m. to 11:00 a.m. at the VFW Hall. 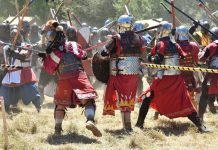 The cost is $5 for adults, $2 for kids ages 6-13 with children 5 and under free. Pictures with Santa are $5. 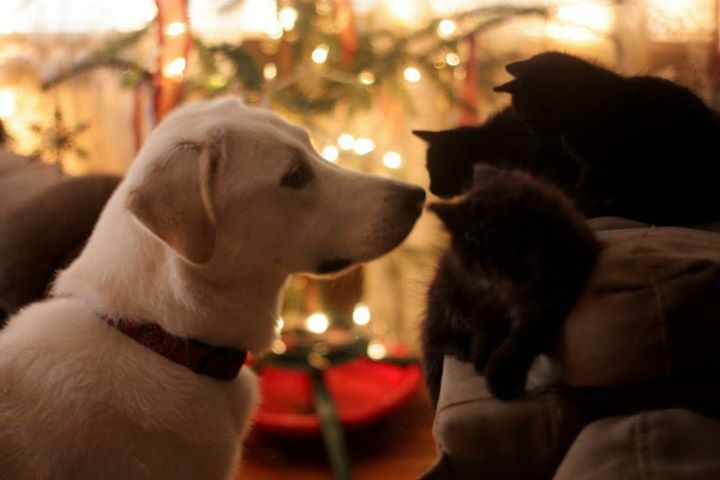 If you want your pets in your holiday photos, hoof it down to Elma Feed and Farm Supply. Photo credit: Jake Royer. From 10:00 a.m. to 2:00 p.m. December 2 The Elma Feed and Farm Supply will be hosting Santa so you can have pictures with the pets and the kids for just $5. At 10:30 a.m. you can join the South Beach Buccaneers as they welcome Santa to the Westport marina. Delivered to shore by the US Coast Guard, the man in red will be escorted to the Westport Maritime Museum. You can visit him in the Lens building there. Next door at McCausland Hall, you can enjoy free refreshments, play “Walk the Plank” for prizes, hang out with the pirates and shop at the Kids only store. “I saw Monte Kissing Santa Claus,” is the theme for this year’s Festival of Lights in Montesano set for Friday through Sunday, December 8-10. The Harbor’s biggest holiday bash is a perennial favorite featuring the Grand Parade Saturday night followed by the Lighting of the Yule Log at Fleet Park. 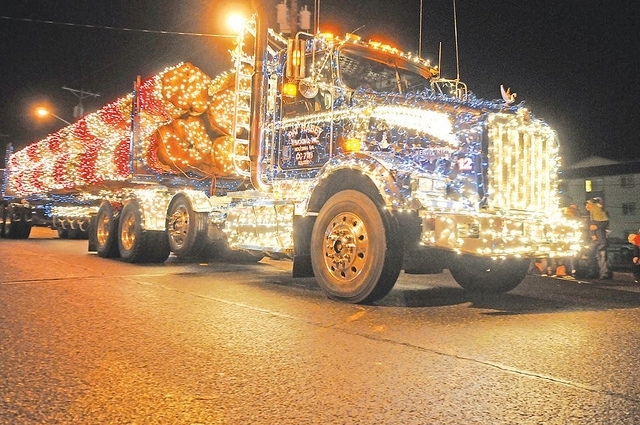 Even log trucks get gussied up for Montesano’s Festival of Lights. 7:00 p.m.-8:30 p.m. – free live vocal entertainment at Montesano High School. 9:00 p.m. – adults can enjoy the Ugly Sweater DJ Dance Party and Auction at Montesano City Hall. Tickets include a souvenir cup and two drinks. They are $15 in advance and $20 at the door. Wear your ugliest Christmas sweater for chances to win a prize. Pancake Breakfast with Santa at Montesano Community Center. Jingle Bell Jog, a 2-mile fun walk or 12k race. 10:00 a.m. to 3:00 p.m – Craft Fair and Christmas Bazaar at Montesano Junior High gym. 2:00 p.m. – A children’s puppet show, “Shoemaker and the Elf” at the Montesano W.H. Abel Memorial Timberland Library. 4:00 p.m.-6:00 p.m. – Chowder Feed at Montesano Fire Station. Donations accepted. 4:00 p.m.-7:00 p.m. – Chili and Cornbread at Montesano Moose Lodge. $3 a person. 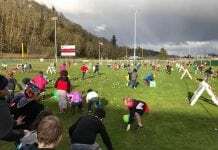 You can create a cup of cocoa at The Cocoa Factory at Montesano Fitness Center. Donations accepted. 6:00 p.m. – Grand Parade at Fleet Park. 7:00 to 8:30 p.m – Lighted Nativity at Montesano Presbyterian Church. 7:30 p.m. – The Dukes of Swing are performing at the Montesano Moose Lodge. $3 a person. Red and white lights make logs look like giant candy canes during a past Festival of Lights parade. Photo courtesy Montesano Festival of Lights. 1:00 p.m. – Bringing in the Yule Log and Christmas Sing-a-long at Schafer State Park. This free event includes refreshments. For more information, check out the Montesano Chamber website or Montesano Festival of Lights on Facebook. Inquiries can be e-mailed to montesanofestivaloflights@gmail.com.